State Foreign Trade Company Ukrinterenergo is a state unitary commercial enterprise which was established based on state ownership in accordance with the Order of the Ministry of Energy and Electrification of Ukraine No 03 dated 15 January 1993 and affiliated to the Minstry of Energy and Coal Industry of Ukraine. The Company was established with the purpose of efficient realization of export potential of Ukrainian electrical power industry. Since its incorporation, the Company has been constantly expanding its scope of activity. As of today the Company has developed a reliable base of business partnership and cooperation in Ukraine and abroad. Among the Company’s priorities are export and import of electricity, electricity transit provision through the power grid of Ukraine, supply of electricity to consumers. 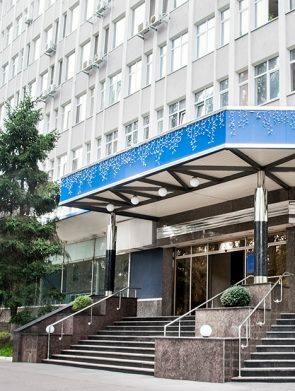 Owing to the wide application of marketing technologies, optimization of the main business processes, continuous improvement of the Company’s structure, high proficiency and many years’ experience of its employees, SFTC Ukrinterenergo has managed to achieve significant results both in Ukraine and abroad. SFTC Ukrinterenergo’s scope of activities includes project management in the field of power industry; ensuring export of Ukrainian power industry products; attraction of modern technologies and equipment to Ukraine; generation of electricity and thermal power; export and transit of electricity. Owing to high professionalism and qualification of its employees, the Company has reached significant results of activity in Ukraine and abroad.